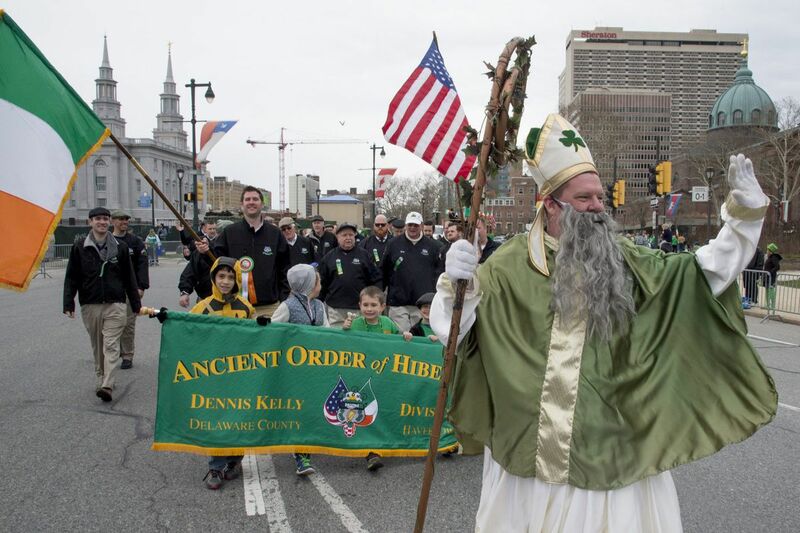 John Cooke, dressed at St. Patrick, leads members of the Ancient Order of Hibernians Div. 1 Dennis Kelly during Philadelphia's 2016 St. Patrick's Day Parade. St. Patrick's Day is right around the corner, and there are plenty of ways to celebrate in Philly. From family-friendly parades to the most, ahem, comprehensive bar crawls, here are our picks for what you should be doing to celebrate this traditional Irish holiday. >>READ MORE: Do St. Paddy's Day parade signs serve as a warning or a dare in Philly? You don't want to miss one of the oldest parades in the country, which goes around City Hall and down Market Street. There will be plenty of Irish music, Irish dancers and decorated floats. The theme for this year's parade is "St. Patrick, bless those who respond to the call of the needy." This four-day festival features everything from live music to Irish step-dancing to face painting. For those of you who are Irish music fans, the festival is kicking off with a performance by The Galway Guild, a Philly-based band whose rock sound is rooted in traditional Celtic music. One of the city's oldest St. Patrick's Day traditions, the Leprechaun Run raises funds and awareness for the Philadelphia chapter of Special Olympics Pennsylvania. Runners can opt for the 5-mile run, 2-mile fun run, or the lucky 7-mile run. Awards are given to the winners of the 5-mile and 7-mile races in different age brackets. St. Paddy’s festivities at Xfinity Live! Xfinity Live! will be pouring green beer and showering partygoers with cash confetti in honor of the holiday. Stick around for live performances by cover band Bangarang in the Victory Beer Hall. Party all day at Fado Irish Pub, with tons of Guinness and Irish whiskey, as well as live music and rugby games. This party starts before most revelers are generally awake, so wear green and show up early with the rest of the rabble-rousers. No ride, no problem. Just take the Erin Express — a fleet of 10-plus buses that are set to run for three straight weekends in March, ending on St. Patrick's Day. The Erin Express shows up every 15 minutes to a dozen participating locations, including Smokey Joe's and Cavanaugh's Restaurant and Sports Bar. No reservations are needed — show up to one of the bars on the list found online and go from there. Hundreds hopped aboard Philadelphia’s annual Erin Express on St. Patrick’s Day. March 17, 2012.